Ideas on homemaking and cooking with zero spending. 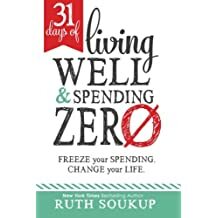 I finally read the 31 Days of Living Well and Spending Zero by Ruth Soukup. It is a good read for the newbie but for a veteran frugal homemaker it was nothing new except a few DIY craft ideas. What it did do was get me back in the mode of not spending and working with what I have on hand. I don’t know that I can do this extreme 31 days of not spending. She means nothing, not even groceries. You completely work with what you have and give yourself a tiny little cash allotment for emergencies such as toilette paper. I suppose you could tailor it to your own liking and doability. We have a tight budget for the next week and a half and I needed groceries to feed 4 people and I’m feeling the itch to do some creative projects on the house. I have less than $100 in the checking account. I did a few things that I haven’t practiced in a long time: I made a menu for the next 10 days and a shopping list to accompany it. I considered the foods I already have in the cupboard and freezer…which is not a lot. Being that we just moved, I had already used up my stocked up pantry, however, I do have a LOT of flour, both wheat and white and a surplus of yeast. You can make bread, country biscuits, pizza dough, and even tortillas with just those three ingredients! We are also going vegetarian for the summer. We love our bar b qued chicken but lately it’s too hot and I went on this meat spree and found that I was exhausted all the time and my eldest son would wake up with this hideous breath like a deer had curled up and died in his mouth three weeks ago. When we go veggie we smell good, we feel good, and I feel clean from the inside out. My energy has already returned from a couple days of this. Off to WinCo with my little list minus meat. I bought a weeks worth of goods for $75. I bought exactly what we needed and no more, no extras, except some chocolate that they have in bins. Love WinCo. Today we made homemade country biscuits from the white flour and shortening from Christmas last year. It was pennies to make and Arjan learned how to make them, roll them out, and use a mason jar lid to cut the dough into circles. It’s the first time my 5 year old has completely baked something and I had the moment to explain why we choose to cook and bake from scratch and fresh ingredients (despite the old shortening). Both the kids learned all about how to set up the kitchen and proceed into a baking journey, some math, being creative, and the love and fun that goes into cooking at home. Homeschooling and being frugal all in one 25 minute moment. And then we had amazing biscuits this morning with lots of butter and jelly. Yummy. I had a lot of leftover rice, some funky green beans, and frozen veggies. I made a delicious and simple casserole for our late lunch and put a side of olives and onions on the side. Casseroles are a great way to use up a lot of extras. You just add the cream of mushroom and cream of chicken or cheese, some seasoning, and top with cheese, bake 35 minutes. Ooh boy. Now, the next issue is the projects I have in mind. I need to paint some doors and my kitchen cabinets. We smartly saved every bit of paint from all our work on the house and I found enough yellow to paint the kitchen drawers and cabinet doors. I found some of the sea foam green from the boy’s room to paint the back door. I know that sounds funky, and it is, but so is my whole house. Every room is a different color so why not got wild with the doors. What happens when you use what you have instead of running out the door to shop is that you get very creative. You use up food that would go to waste, you use your old paint and crafts to make new things and then you feel good about it. You wear clothing you forgot about. But what is really great about this no spending, besides saving a ton of money, is that you learn to be content…truly, truly content with life. You learn to stay home and enjoy it. You learn to cook all sorts of goodies and love being in your kitchen, you learn to craft and sit around reading stacks of books free from the library. You even start doing stuff like plant gardens and knit blankets. If you would like to do a 31 days of zero spending you can get the book at the library to get ideas, however, this is the sum up of the whole idea: You pay the rent/mortgage and all the bills and that is it! You spend not a dime on anything else except maybe gas and a couple grocery items that wouldn’t last a month such as milk or bananas. You do NOT go out to eat, no coffee at Starbucks, movies out, not even Redbox. You don’t even grocery shop if you can avoid this. You eat from the surplus from years of over shopping and all the packed cupboards and freezer. When you run out of something you get creative. This is a great way to freeze spending and really get clear about your spending habits. It is a fantastic cure to out of control shopping. You go cold turkey and then white knuckle it for 31 days. Ruth said her family saved a $1,000 the first month of no spending. Wow! Money goes so fast with a latte here and dinner take out, some movies from Redbox while shopping for groceries we don’t really need, shopping because we are bored. This brings your attention right to the problem areas. I have been frugal so long that it may be a bit before I can motivate to do such a big challenge. We already don’t go out for much of anything. Going to the movies is every few months, dinner out doesn’t happen, coffee out is only if I have earned a Starbucks card from my bank card. What I did realize is that we are doing a lot of in between grocery trips for extras. I must get back to making menus and grocery list and sticking to it for the week at the least. Making my own cleaners is another money saver. Another way to not spend is getting in the habit of walking everywhere you can. Even with children, you can do it with a wagon large enough for a child or two and a couple bags of groceries. Without kids, it is so easy to bike or walk to everything. Right now the weather is in the hundreds and I’m a wimp but come fall I am going to see if we can walk to everything for 31 days. There we have it! The next challenge, 31 days of zero driving. Previous When a husband and father is deported. Next The Lazy and Cheap Housewife. I’ve never been able to do a complete 31 day spending freeze, but I get pretty darn close. I will try to get the book through interlibrary loan. When you said that if you are a veteran saver, I was reminded that recently I have noticed that when I read articles and books on how to live frugally, I usually find that I have done everything in the article. It’s rare that I find many new ideas. It’s true! Everything has already been done…by our great grannies! Love this post! So inspiring. Some weeks we will eat out of the freezer but a whole month is a big challenge. I tend to spend a little here and there and it does add up! I’m not a starbucks but dunks almost ever day….slightly cheaper….still, though! Do I need this every day? Local Goodwill is another of my “cheap” places but not when I spend 20-30 on a single trip and then run to the plant store looking for clearance plants. Great post!!! I’m just like you. I have to either NOT spend ANYTHING or I can get into trouble with my “frugal” shopping. Is dollar tree frugal? I find myself waiting for them to open. In need a few cleaning supplies and 2 night lights. My lovely elderly mom in law is visiting this weekend! You could make your own cleaning supplies with vinegar and dish soap. I have done a lot of things with the Dollar Tree, believe me. I’ve made cleaners before! Just didn’t have any vinegar around so I’d have to get something. I make my own laundry soap usually which makes that pretty cheap too. I’ll have to get more vinegar!! Very timely tips. I was talking to a good friend yesterday who said she’s wanting to simplify her modern family life and I thought of you. I’ll send her a link to this!